Advice: Do lots of reading up and research before you start. 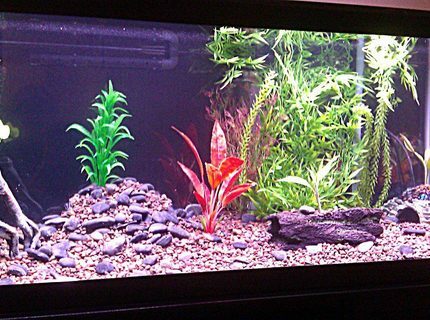 Description: Freshwater tank, 180 Liter, no live plants. About Yourself: I just love fish. Nothing more relaxing than watching a fish tank. Advice: Be patient, add one fish at a time, and get as big of a tank as you can. 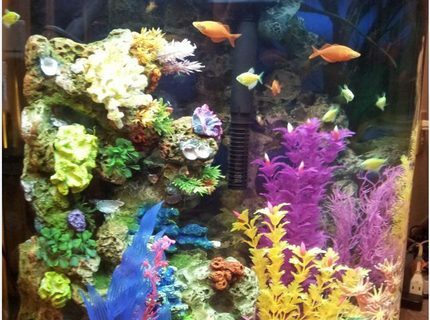 Quote: You know you're addicted to aquariums when there's nothing to eat in your fridge, but your freezer is packed with fish food. 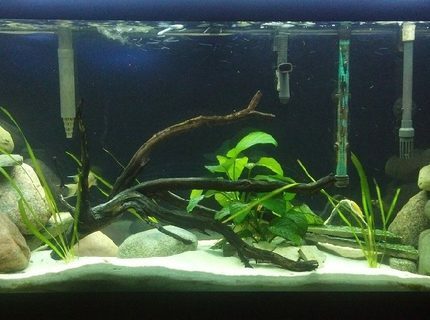 About Yourself: Started the hobby 5 years ago with a Betta and his pirate ship decor, but now prefer creating a more natural environment for my South American fishes. Fish Kept: Bettas, Corydoras, and Lemon Tetras. 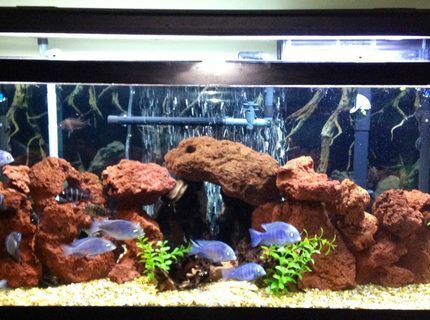 In my next tank I'd love to have cichlids. 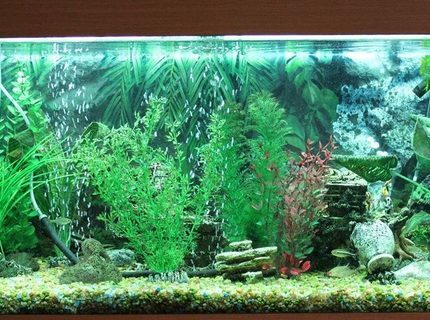 Advice: Build your aquarium around the needs of your fish rather than on the aesthetics of the aquarium itself. About Yourself: I've never had a fish tank until just recently. Life got a little rough and I started looking for some type of hobby to get my mind off of things. I started with a little 10 gallon tank (it's a "Rocky" themed tank which I'm proud of). I found how relaxing it was to just sit and watch my angel fish at night. I was hooked, maybe I'm going overboard now. All is well, I'm having fun. I bought a second tank, brackish setup, for a Green Spotted puffer that I saved from Walmart. His name is Michelangelo (from the Ninja Turtles!) Then I got pretty serious and purchased my 75 gallon. I've put so much time and work into it but I love it. I've got it lined up to pick up a 92 gallon corner tank next week. 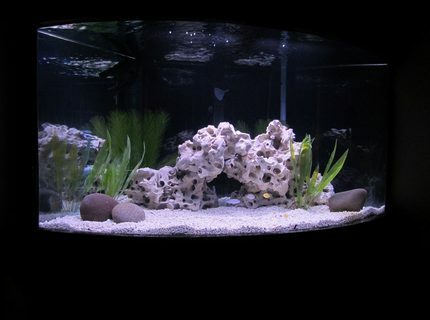 I plan to set it up as a saltwater tank, my main fish will be a dogface puffer, I totally love' em! Anyway, I'd appreciate any advice or input from anyone. Don't be too hard on me, I'm just learning. Thanks and I look forward to hearing from you guys. Corals/Plants: I have a few live plants that don't seem like they are doing too well. I think I may need better lighting. Advice: I AM a "New Hobbyist"!!! And totally loving it! 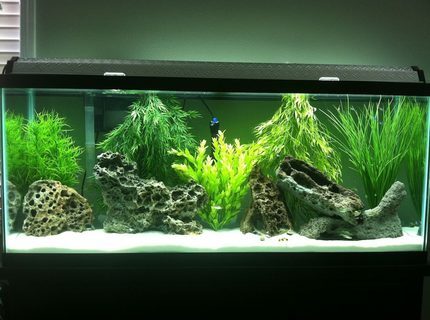 Description: Here's my 75 gallon freshwater. Don't be too hard on me, I'm new to the hobby. I just added a new fish today, an Electric Catfish! I'm so excited. I also really love my Delhezi Bichir. Other fish also in the tank: Senegal bichir and striped raphael and featherfin cats. I have a couple live plants. 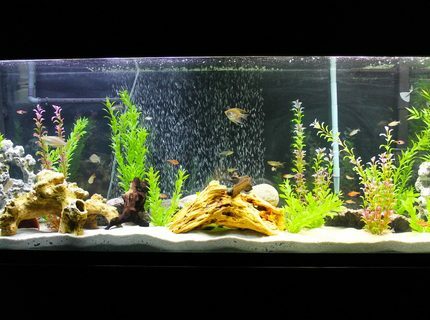 I have a few ideas for my tank and will be changing things up soon. I just love this stuff! Any suggestions would be appreciated, Thanks. About Yourself: Had knee surgery and got bored sitting around house so i got my first tank, a 29, and then addiction began. Had seven tanks at one time. Currently have 4. Will upgrade my 75 soon. 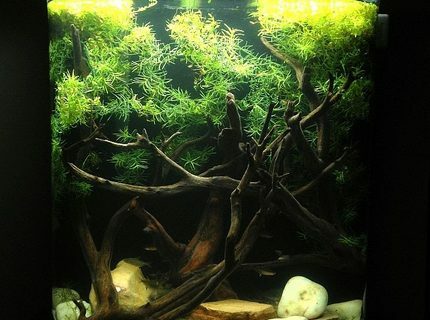 Fish Kept: 4 mystery snails, 1 oto catfish, 1 farlowella twig catfish, 1 red tailed black shark, 3 bala sharks, 2 clown loach's, 4 silver dollars, 8 longfin zebra danio's, and 10 neon tetra's. 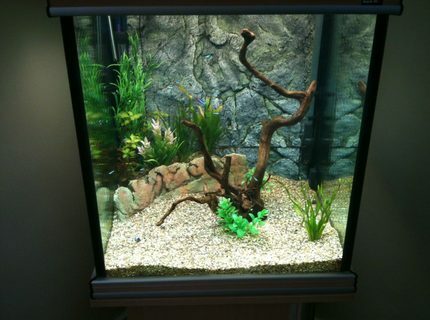 Advice: Keep up with water changes and watch out for diseased fish in tanks/systems you buy from. Corals/Plants: Fake plants, River rock, plays sand for the substrate, drift wood and some fake wood pieces. Advice: Do your homework! Use your imagination. With aquariums sky is the limit.